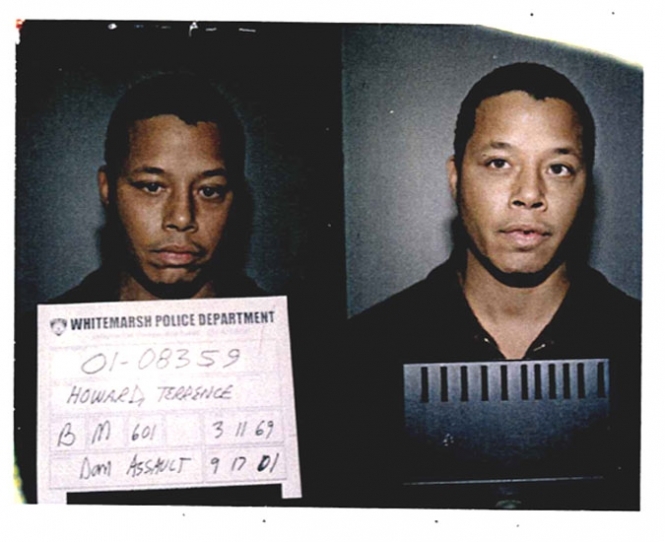 Actor Terrence Howard posed for the above mug shot in September 2001 after Pennsylvania cops arrested him for assaulting his estranged wife. According to a Whitemarsh Police Department report, Howard--a 2006 Academy Award nominee for his role in 'Hustle & Flow'--argued on the phone with Lori McCommas and warned her, 'Don't disrespect me by hanging up on me or I'll come over and hurt you.' After McCommas hung up and called 911, Howard went to her house, kicked in the front door, and punched the mother of his three children twice in the face. When a Whitemarsh cop responded to the scene, Howard admitted, 'I broke the door down and hit my wife.' After being charged with a variety of crimes (simple assault, terroristic threats, harassment and stalking), Howard subsequently pleaded guilty in 2002 to disorderly conduct. Submitted by SpecialEd on Thu, 2011-06-02 21:53. Submitted by Midknight on Thu, 2011-05-12 04:47.
the world,including the justice system"Well just how much justice can you afford"? revolves around that cash, Not to say anything against Mr. Howard.I dont know what he did,she did or anything that happened. Submitted by Shelly Shores on Tue, 2010-08-31 04:48. What a farce the legal system is... After threatening his wife, kicking her door in and beating her up he gets the charges dropped to disorderly conduct!. This man is a wife-beater and obviously as mentally deranged as Mel Gibson! I can't believe how the legal system just gets all "star-struck" and lets these celebrities off with a slap on the wrist!! !